December! How shall we celebrate? 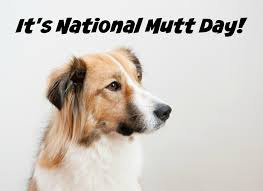 December 2 - National Mutt Day! A pup doesn't have to have papers to be a bundle of love. December 3 - National Roof Over Your Head Day! One more reason to be thankful! December 4 - National Sock Day! December 5 - Bathtub Party Day! December 6 - National Microwave Oven Day! December 7 - National Pearl Harbor Rememberance Day! December 8 - National Brownie Day!